If you’re an avid follower of our blog then you’ll know that I love a seasonal door hangers, like my Spring Door Hanger and Happy Cinco de Mayo Welcome Sign. This year I’m excited to introduce my new Halloween Wreath. Surprisingly my door lacked a unique outdoor Halloween decoration. In the past a department store variety has sufficed, but this year, I wanted something more. If you’re in the same boat, you have come to the right place. Stay with me and see how you can make a DIY Black Light Halloween Wreath for your front door too. The idea for this came about as I was walking through the craft store. Actually, if I’m being completely honest, my husband gave me the inspiration. He said he wanted to put a black light on our patio this year for Halloween and I immediately thought about how awesome neons look in black light. So, as I was in the craft store, I was looking for items that could come together to create a glow in the dark Halloween wreath fit for 2018. I was happy to come across some great materials. Since we are seeng a lot of neons on black this year, it wasn’t hard to incorporate neon paints onto a black wreath. And wow, do they glow! So, let’s take a look at what materials you’ll need and the steps to create this dark and sharp Halloween decor wreath. Start with the mini skulls and neon paint. Get your creative on and paint each skull as desired. You can do a sugar skull design, or paint one skull in each colour. Set them aside and allow them to dry. While the skulls are drying, begin to work with your flowers. If they came in a bouquet, cut and separate them. Place the flowers in a group in the bottom left portion of the wreath. Put the bigger flowers in the middle of the grouping and smaller flowers trending out. Do this without using any wire to get an idea of how it will look. Once you’re happy with the arrangement, you can begin to wire each flower onto the wreath. Use the wire cutters to cut the wire into 5″ lengths, then wire each flower individually. This may take some time, but to be sure the wreath will last, make sure the flowers are secure! Almost done this awesome black halloween wreath! Using the hot glue gun attach the mini skulls to your wreath. Replace your porch light with a black light and your set! Light up your porch with this neon on black halloween wreath. My oldest, always willing to help out! There you have it! A bright, colourful Halloween Wreath perfect for your front door. I’m happy to finally have a Halloween door wreath that’s unique and trendy! Will you give it a try? 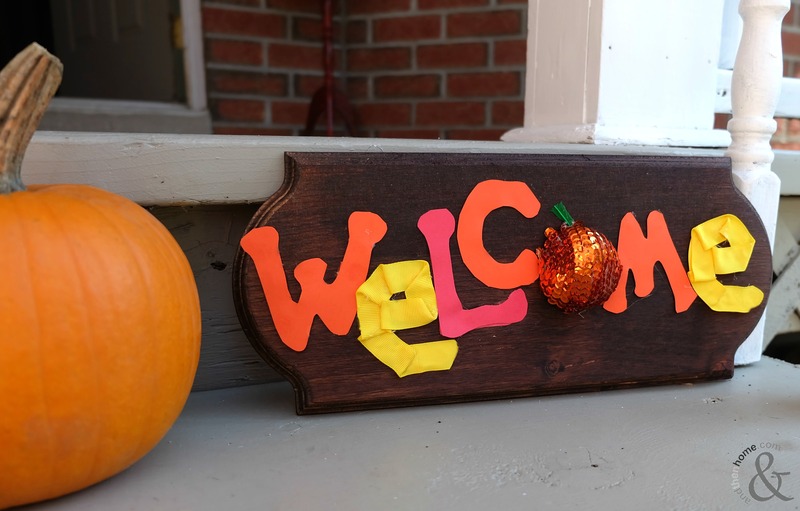 What are you hanging on your door this Halloween? If you’re looking for more amazing halloween decor, be sure to check out our new Distressed Countdown to Halloween Blocks or our classic Easy DIY Halloween Paper Bag Lanterns, an easy halloween craft that will light up your walk way!